In 1941, after training as a German spy in occupied France, Chapman was parachuted into Britain with a revolver, a wireless, and a cyanide pill, with orders from the Abwehr to blow up an airplane factory. Instead, he contacted MI5, the British Secret Service. For the next four years, Chapman worked as a double agent, a lone British spy at the heart of the German Secret Service who at one time volunteered to assassinate Hitler for his countrymen. Crisscrossing Europe under different names, all the while weaving plans, spreading disinformation, and, miraculously, keeping his stories straight under intense interrogation, he even managed to gain some profit and seduce beautiful women along the way. The Nazis feted Chapman as a hero and awarded him the Iron Cross. In Britain, he was pardoned for his crimes, becoming the only wartime agent to be thus rewarded. Both countries provided for the mother of his child and his mistress. Sixty years after the end of the war, and ten years after Chapman’s death, MI5 has now declassified all of Chapman’s files, releasing more than 1,800 pages of top-secret material and allowing the full story of Agent Zigzag to be told for the first time. 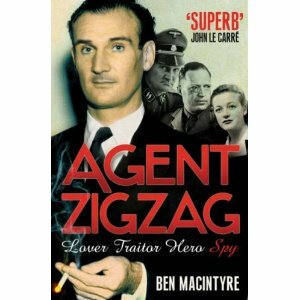 Agent Zigzag brings to life an extraordinary man; a man whom neither the British or Germans truly understood, but both believed him loyal to them alone. Chapman was courageous, intelligent, duplicitous, and yet possessing an integrity that transcended his espionage operations. He was a fascinating character, and his life makes for engrossing reading. MacIntyre is not the first to try to capture the essence of Eddie Chapman, but he has comfortably superseded previous efforts with Zigzag. I highly recommend picking up a copy; Eddie Chapman is a man everyone would benefit from knowing just a little bit better. Sounds like this would be great stuff for a film! Of course, I carry a cyanide pill in my left sock at all times. Hahahaha! There are better places to keep a cyanide pill, but I hope it isn’t required! It would make a great film, and knowing Hollywood’s inability to write anything original, it might happen yet. Any reading suggestions?